There are certain musicians who can take pop music and completely flip it on its head. Brian Wilson's "teenage symphonies" were extra lush song cycles meant that somehow appealed to the rock and roll crowd more akin to liking two-and-a-half minute standard pop tunes. Prior to Brian Wilson and his brothers, Phil Spector created the now infamous "wall of sound"- literally throwing everything into the mix that his recording capabilities could handle. Despite the noise, the songs maintained a feeling of completely literate, interesting and downright intelligent pop music. The Ronettes were making music for high school dances, yet there was artistry there. We can go through every decade of pop music and find specific examples of musicians and bands (and perhaps more appropriately, producers), whose knowledge of what pop music can and should be has constantly pushed the envelope. By synthesizing the best parts of different subgenres of popular music, many of our greatest artists are just that because somewhere in their career they put out music that was unheard of before then. Something new, something unique and ultimately, something that has a lasting impact on the listeners, who find meanings through the sheen of pop and obsess over the music in their own ways. I've heard the name Judee Sill for years. I'd seen her two albums talked about many times throughout my forays and obsessions into the world of 1970s California Folk Rock. It wasn't until recently, however, that I finally took a chance at giving Judee a listen. Imagine my surprise when I heard music that could be likened those late 70s Beach Boys recordings (my favorite), instead of what I expected to be a mediocre Joni Mitchell or Carly Simon carbon copy with some heart-on-the-sleeve lyrics. On Heart Food Judee Sill created what is one of the most unjustly unheralded achievements in all of contemporary folk music. Everything is based primarily on guitar and piano, but other stringed instruments get added to the music, giving her otherwise personal and intimate songs a grandiose sense. Sill's singing has a unique quality, often starting her verses at a quieter, softer timbre before barring her teeth and singing as though she has a case to plead to God. In fact much of the album has religious conotations, references to God and spirituality without being overly zealous. The comparison to Brian Wilson applies in this aspect as well. Story-like lyrics that reference a troubled soul, allowing herself to breathe in the only way she knows how: creating beautiful music. 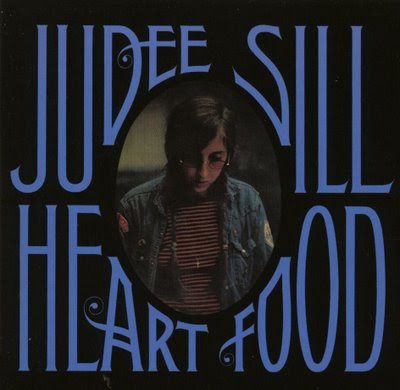 It's a shame that Judee Sill's Heart Food isn't considered by more to be one of the best records of its time. It's a record unlike any others. It's clearly folk music, but it's clearly pop music. References could be drawn, similarities between Judee and other artists could be attempted, but Heart Food is a record that is all it's own. A record of epic scope, rooted in the most minute details of the artist's voice.